Reaching 40 is an incredible milestone. Most of us are through having babies, nursing babies, potty-training toddlers, and all the other joys of our 20s and 30s. Our 40s are a time of new freedoms and adventures. However, it is also the time when our bodies and faces start changing and we become concerned about maintaining our youthful appearances. And sadly, we also start paying for the sins of our youth – like too much sun exposure. Step 1: What are my Anti Aging Skin Care Concerns? The first step in accomplishing our best anti aging skin care is to define our concerns. There are several issues that are common after 40 and often we are concerned about more than one of them. Good research can help us identify anti aging products which address more than one issue. So, what are your concerns? Step 2: How do I treat my Anti Aging Skin Care Concerns? The next step is to decide how to treat each concern. Below are the product types and ingredients to look for in each of the products. Hyaluronic Acid: Hyaluronic acid plumps and softens the skin. If you are concerned about fine lines and wrinkles, there are two products you must have. The first is a good sunscreen, used EVERYDAY, and the second is a treatment or anti aging serum containing retinol. Retinol is the absolute gold standard (non prescription) ingredient for reducing the appearance of wrinkles. Look for retinol in the ingredient list of the product and use it twice a day. Retinol: Retinol is a vitamin A compound and is available in over the counter products. It is shown to reduce the appearance of wrinkles and other sun damage, like dark spots. The prescription form, tretinoin, is much stronger. Hydroxy Acids: Hydroxy acids are exfoliants, meaning they remove the upper layer of old, dead skin and help grow new skin. There are several types of hydroxy acids, but beta hydroxy acids (salicylic) are the best at reducing large pores. Niacinamide: Niacinamide is also know as vitamin B-3 (niacin). It helps reduce water loss in the skin and may improve the appearance of enlarged pores, uneven skin tone, and dullness. Vitamin C: Vitamin C is an antioxidant. It helps protect the skin from sun damage, evens skin tones, and fades dark spots. Coenzyme Q10: Coenzyme Q10 may protect from sun damage and prevent damage from free radicals. Plant and Tea Extracts: Unscented plant and tea extracts have antioxidant and anti-inflammatory properties. Some of us are done with acne and others have it for the first time. Look for these ingredients in your products and avoid overly emollient moisturizers. 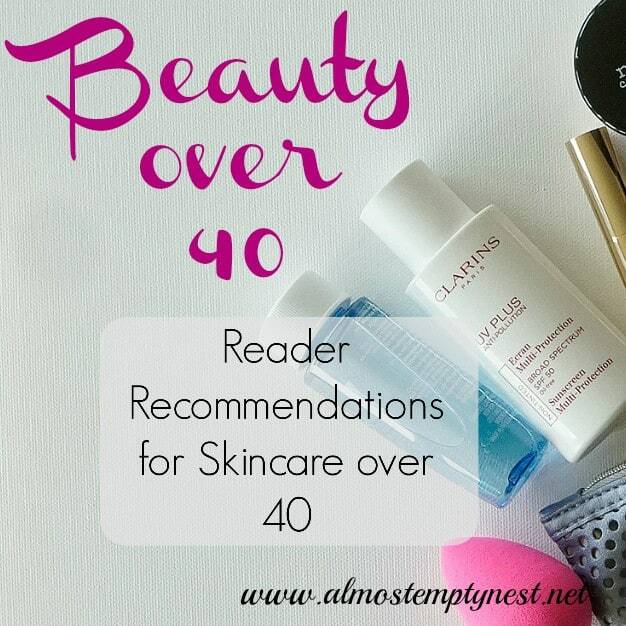 Check out review sites, ask friends, and see: Beauty over 40: Skincare Products I Love and Beauty over 40: Reader Recommendations for Skincare over 40. A great review site is Beautypedia. Remember that price is not always an indication of effectiveness. Many drugstore and lower priced department store products are just as effective as their pricier counterparts. Watch videos on You Tube. There are so many fun and informative skin care and make-up tutorials on You Tube that it is easy to spend hours watching them. I like to focus on the ones for gals over 40. 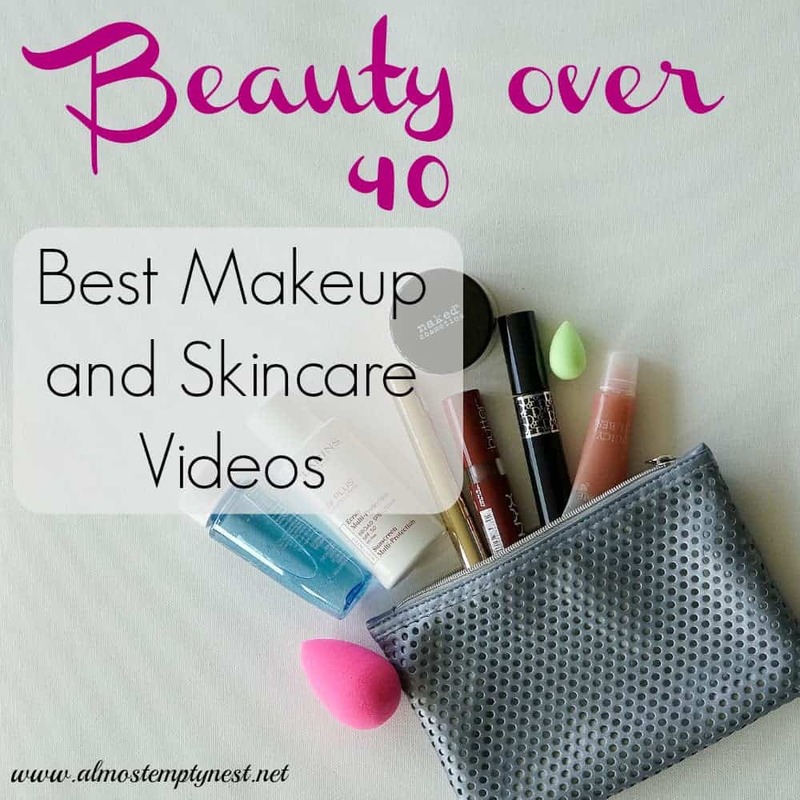 See Beauty over 40: Best Make-up and Skincare Videos. 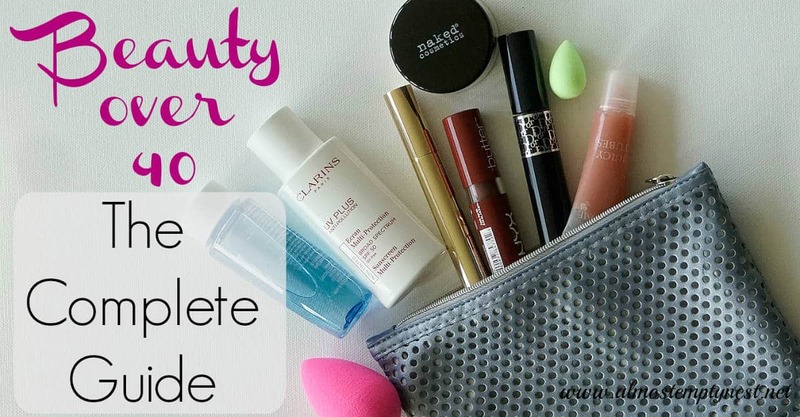 Get a make over at a cosmetic counter or Sephora. If the products are too expensive, ask the makeup artist to recommend a cheaper version or explore Beauty Blogs and Beauty Videos that recommend “dupes” for expensive products. 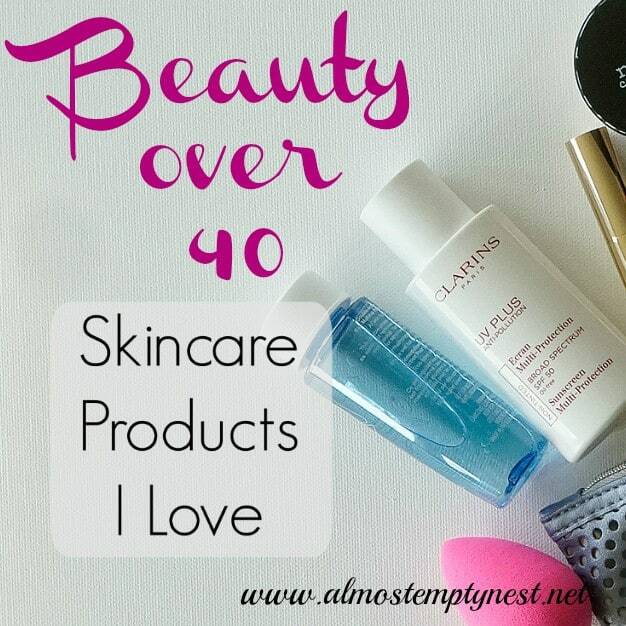 I started the Beauty over 40 series because I wanted to know what I needed to do to maintain my skin, correct some dark spots, and update my makeup. I had been in a skincare/makeup rut for quite a long time. Researching the articles and buying new products has truly been a fun journey. I watched way too many videos and bought way too many products, but, hey, what is a good midlife crisis for?!? I still have several videos and products on my list to try. 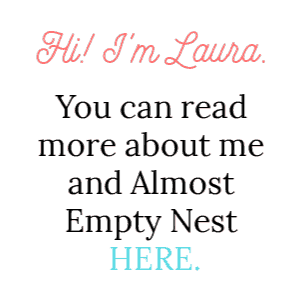 I have listed my favorite product discoveries below. Alpha Hydrox Spot Light Targeted Skin Lightener: This product contains Hydroquinone, which is helping to fade some some sun spots on my arms and chest. Benefit POREfessional Primer: Love, love, love this stuff. The ONLY primer I have tried that actually makes my pores disappear. Zum Facial Oil: Also in love with this product. It smells yummy and feels really good on my face and neck when I am in need of a moisture boost. Lancôme Genifique Yeux eye cream: A great eye cream that goes on easily. Lancome Cils Booster XL (eyelash primer): My daughter kept telling me how great eyelash primer is and I thought it was a tremendous waste of money. Until I tried it. Wow. It makes a big difference in the thickness and overall effect of my lashes. Beauty Blenders: I bought the whole set. I use the big pink blender and the gray blender daily. I have not found a use for the little green blender. The soap is included in the set. One of the beauty vloggers I watched said that she had been constantly asked for a cheaper “dupe” for the beauty blender and could not find a really good one, so for now the original reigns supreme. Stowaway Creaseless Concealer: I love this concealer. It is thick enough to cover, but still easy to blend. RoC Retinol Correxion Deep Wrinkle Daily Moisturizer with Sunscreen Broad Spectrum SPF 30: Retinol and sunscreen together. Might could save me a step in the morning. OZ Naturals Vitamin C Facial Serum: This product contains Vitamin C and Hyaluronic Acid at a very reasonable price. Achieving our best Beauty over 40 has some new challenges, but there is no reason why we can't still look hot as we glide from our 40s into our 50s and beyond. My research has said the key is sunscreen, sunscreen, and more sunscreen. If you are younger than 40, get on the sunscreen bandwagon now. It is never too young to protect from sun damage. Researching before you shop will save you money and disappointment with products that claim in big print on the front label to help, but don't have the ingredients to actually do the job. 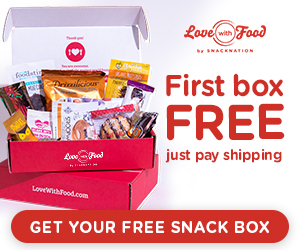 Shopping online is a great option because it is easy to look at products and research ingredients and reviews at the same time. If you are headed to the store, grab these printable cards to slip in your wallet to use as cheat sheets. What seems clear at home, suddenly becomes very overwhelming at Ulta with thousands of products vying for your attention with their bold claims. (5) What Causes Large Pores? This was great. My concerns are similar, mainly dry skin and sensitive skin. I’d love to try the Zum facial oil. Sounds really luxe.